Angela on American Public Media Pipedreams! Listen to Pipedreams April 16, 2018 broadcast for Angela's performance of two of her original compositions -- A Joyous Celebration (2009) and Courage in a Time of Struggle (2011-12). Angela Kraft Cross is an internationally respected virtuoso organist, pianist, composer, and eye surgeon. To learn more about her see her Biography page. Dr. Kraft Cross is passionate about performing and sharing the joy of organ music through stimulating audience-accessible programs. She enjoys providing verbal program notes when appropriate. To contact her about playing a concert, please contact by Email. Dr. Kraft Cross is a composer and her works have been appreciated by audiences internationally. She has released her first album of original compositions, Sharing the Journey in December 2013. 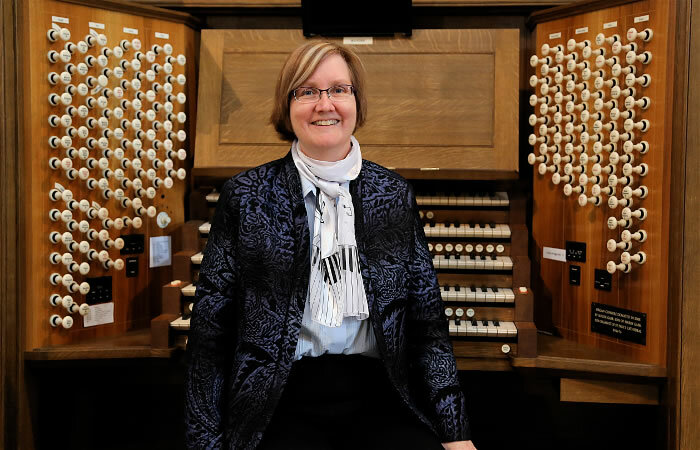 Dr. Kraft Cross is the Founding Director of the San Francisco Peninsula Organ Academy (founded 2014) which provides generous scholarships to young concert organists to go on short-term intensive overseas study trips. Please visit the calendar page for complete concert listings. You can also contact Dr. Kraft Cross by Email or by snail mail at P.O. Box 941 • Redwood City CA 94064.